Hide this Project (Raviraj 93 Avenue) Discover properties in other projects by hiding the ones that doesn't interest you. You won't see them in your searches further but you can unhide anytime later. Hide this Dealer (Satish Biradar) Discover properties by other dealers by hiding those whom you have already spoken to. You won't see them in your searches further but you can unhide anytime later. 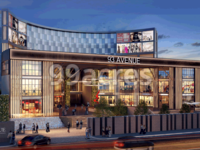 Raviraj 93 Avenue is one of the commercial developments of Raviraj Bokadia Creative, located in Wanowrie, Pune. The project offers commercial shops and office space at very competitive and affordable price. The site is well connected by different modes of transportation and is in close proximity of various civic utilities. The project is well equipped with all modern amenities and 24X7 security service to facilitate the business needs. It is approved by Mahaeashtra RERA. Where is Raviraj 93 Avenue located? Wanowrie, a prime residential locality for house seekers in Pune. What is the total area of Raviraj 93 Avenue?The project spans across 2.95 Acres. How many units are available in Raviraj 93 Avenue?The project has a total of 280 units. Which banks are providing loan facility for Raviraj 93 Avenue?Indian Bank is providing loans for this project. How many floors are there in Raviraj 93 Avenue?There are up to 5 floors in this project.